Grab One of the Few Remaining Premium Reseller Licenses and Start Making Money Right Away Selling AD MAGIC -A Genuine 5-Star Course Created By A World Class Copywriter And Endorsed by The Top Dogs In The Industry!! Add Your Name As Publisher of AD MAGIC (a Proven Bestseller), And Sell This Highly-Acclaimed and Well-Received “Evergreen” Course To Your Customers - and Keep 100% Of The Profits! Have you been looking for that special brand of reseller content that is guaranteed to make you money? You know what I mean. The kind that is really easy to sell because the content is eye-opening and results-producing... is created by an authentic expert (and not some wannabe)... is loaded with actionable content end-users rave about... includes sharp graphics that are attention-grabbing... and where the entire package just oozes professionalism? Well, the good news is that you've just found that one-of-a-kind reseller opportunity, and for a limited time only, I'm offering a very limited number of non-exclusive reseller licenses to it all! It’s the Ad Magic Deluxe Home Study Course - an extensive, 400+ page, no-fluff training course that will teach your customers EVERYTHING they need to know to sell more of anything - using the power of words. More active copywriters credit Ad Magic as the “secret sauce” responsible for more breakthrough success stories than any other program anywhere. Ad Magic is a complete course created by Brian Keith Voiles - one of the highest paid copywriters in the world with a client list that includes marketing greats like Ted Nicholas, Gary Halbert, Jay Abraham, Robert Allen,Yanik Silver and Frank Kern - to name a few. As you can see, these marketing giants and many other multi-million dollar corporations have literally sold millions of dollars worth of goods and services because of Brian's killer copy. The list of who’s who in internet marketing that turn to Brian to supercharge their incomes is long but I’ll mention a few. 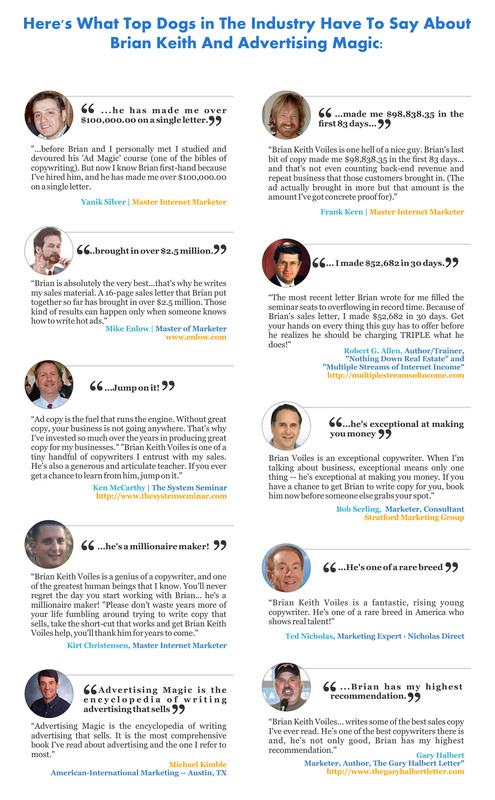 As a matter of fact, take a look at what some of Brian’s top experts and clients have to say about him and his customer-generating ads and sales letter skills. Skip All Of The Work ! And Let Me Show You The Money! This is the License That ALL My Customers Want, But Only A Few Will Ever Get! Your customers aren't going to settle for rehashed guides, poorly written content, or any ho-hum products. They want high quality information that delivers ROCK-SOLID insights and actionable ideas that actually work like gangbusters. They want products that will make them look good, and help them make money. It’s the kind of information products that are almost impossible to find. But, do you really have the time to do that? Do you have the skill and experience to create high quality information products that can sell month-after-month, year-after-year? Sure, you could outsource the work to freelancers. But unless you're willing to pay well above average rates, you'll likely end up with a crappy product that goes nowhere. You might even end up with something so useless - you’re ashamed to sell it to anybody. This is where this special offer of Brian Keith Voiles, Advertising Magic course comes in to save the day. It’s a high-quality, reseller program produced by an industry giant - Brian Keith Voiles - in an evergreen market: copywriting! Just plug in and profit - over and over again. As you may know, Brian is one of the world's most sought after direct-response copywriters and the author of the critically-acclaimed "Advertising Magic Home Study Course." I've been selling Brian's "Advertising Magic Home Study Course" to small business owners and the sales of his course have been phenomenal! In addition to off-the-chart sales… customers are telling us that "Advertising Magic" is THE ABSOLUTE BEST THING they've ever seen on how to create hot ads, promotional copy and web pages for their business! That’s because the concepts revealed in this remarkable course are time-tested and based on psychological truths. They’re proven to work their magic in hundreds of different industries. Not only can YOU use the same powerful strategies and techniques to cash in with your own super-persuasive sales copy - but you can sell this highly-prized wisdom to others - without limit and at a healthy profit. "Customers Are Going Bananas Over This Course!" And that’s because the material taught in Advertising Magic works - period. You see, Brian spent an entire year just writing the Manual for his Course. (This is one HUGE Manual!) It's a how-to "encyclopedia" jam-packed with over 400 pages of proven direct-response advertising and copywriting techniques that melt resistance and close more sales - on the spot! Writing this manual was a monumental project for Brian. If you’re one of the lucky ones... fortunate enough to snap up one the few remaining licenses - you get a proven, high value, bestselling product PLUS all the market-tested support materials to sell it effortlessly... automatically... and continuously. If you've ever purchased reseller rights from me before, then you know that I always do all of the work upfront, so you don't have to. This means that I didn't just include a professional sales page for you, but instead, I've created everything you need to get this offer up and running within a few minutes! And I’m giving the whole enchilada to you on a silver platter. What are you waiting for? This is a very hot topic that’s easy to sell. In fact, it's one of the most in-demand, evergreen topics talked about in business forums and moneymaking circles online. So you know this kind of information will still be extremely valuable for anyone to get their hands on years down the road. And don’t forget - this package comes with Full Reseller Rights! This means there are NO ongoing royalties - or hidden fees of any kind - and NO LIMIT to the number of copies you can sell. It’s as though this ground-breaking product were your very own - one that you created yourself! Take a Look at Everything You Get! You get a killer sales page that's ready to start taking payments! So you can begin having cash deposited straight into your account. By the way... this reseller sales page is only available to officially-licensed resellers. Once the licenses are gone, it'll never be offered again with this same, overly-generous kind of licensing deal. This done-for-you sales page system eliminates all of the work and makes it easy for you to start making money selling this high quality training package - endorsed by hundreds of active, 6-figure copywriters and legendary marketers! CLICK HERE TO SEE YOUR NEW RESELLERS SALES PAGE! Have you ever wondered how those HOT SHOT marketers sell training and coaching programs for BIG MONEY - yet attract hundreds of EAGER BUYERS who can’t wait to fork over their money? This is it. Deliver great VALUE first and the money follows. That’s the secret. But setting everything up on your own can take months of hard work - and thousands of dollars. But it won’t cost you a dime because I’ve built an entire “Jeff Walker style” product launch for you. And it’s yours ABSOLUTELY FREE! You get a complete set of 4 HD professionally recorded video trainings based on “inside information” discovered in this breakthrough sales copy course along with an accompanying set of 4 Solid Gold PDF’s Direct From Ad Magic - that you can offer for FREE during your own launch to attract and convert your prospects into rabid buyers. You’re getting a full package of PROVEN, value-loaded resources. This means you’ll be able to quickly capture attention, ignite interest, trigger desire, and close MORE sales easily and automatically - without ANY arm-twisting, hard-sell tactics whatsoever. When you deploy this irresistible product launch system - you’re giving people what they want: practical, money-making information they can use immediately - whether they buy or not. This is REAL VALUE. And the profits earned from a well orchestrated week-long launch can be more than most people earn all year slaving away at a job they hate. It’s a complete CUSTOMER ATTRACTION SYSTEM that’s designed to work for you on auto-pilot. 5 Amazing Bonuses Worth $2985 That Can Build Your Business, Free Up Your Time and Put More Money in Your Pocket...NOW! FAST ACTION BONUS #1: Reseller Rights to The Faster, Smarter Better Internet Marketing Coaching Program Fast Action takers get full reseller rights to one of the best Internet Marketing Coaching training on the planet. It’s a natural Up-Sell you can offer to your Ad Magic Course buyers - and Keep 100% of the Money Yourself! The training is totally unique it's something your students will love and it'll set you apart from the thousands of 'me to' marketers online that are content to peddle low quality info products to their customers...... You'll receive all the elements you need to rake in easy sales including a tried and tested sales letter, professional graphics and marketing materials including: blog reviews, banners, tweets and facebook posts...And with this easy set up membership reseller system you'll also have the opportunity to start taking orders within minutes of creating your top level account. Imagine leading the way and helping your customers build real 6 and 7 figure businesses online. Once again, you’ll be their HERO simply by offering this powerful, done-for-you video coaching to marketers, small business owners, and home-based entrepreneurs of all stripes. Online Marketing is an evergreen market, so fresh new leads will always be there - ripe for the picking. And with no quantity restrictions - 100% of every sale comes straight to your Pay Pal account. FAST ACTION BONUS #2: Dan Kennedy’s Complete A-Z Information Publishing and Advanced Direct Marketing Business System – INFO RICHES! Learn EVERYTHING you need to know about creating your very own info marketing empire from the leading authority on the subject in the entire world-Dan Kennedy aka the “Godfather of Info Marketing” He has SINGLE-HANDEDLY so far sold more than a HALF A BILLION dollars worth of his own information products. Many of his students have gone on to create their own million-dollar fortunes for themselves. Will you be the next info-millionaire? You get 21+ hours of audio training, complete PDF transcripts, money-making systems, charts and diagrams - a GIANT “sample book” of ads, sales letters and more. It’s the precise, street-smart info-publishing and marketing secrets that can make you a millionaire - several times over. Dan Kennedy is responsible (at least in part) for more marketing success stories (both online and offline) than any other expert - anywhere. Doesn’t it make sense to learn all you can from this guy - especially when you can get in on one of his all-time, most popular programs as a FREE BONUS - at absolutely zero cost to you? 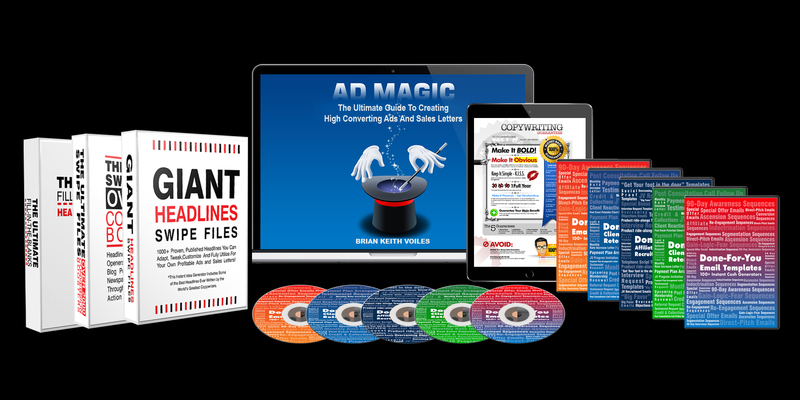 The First 10 Action Takers to grab the Ad Magic Reseller License also qualify for an Official Reseller Rights License to The Killer Copywriting-in-a-Box Bundle - a complete backend package of additional, top-drawer marketing and copywriting courses, special reports, audio programs and more for instant and automatic “backend” sales! You get an unlimited quantity resellers license, a perfect copy of every element of the package, including high ticket audio programs like 21 Ways To Double Your Sales, (a 6 CD plus workbook program) AND Secrets To Ultra Successful Selling ( a 12 CD course)... plus much, much more. Successful launches never rely on just one product. That’s why I’ve painstakingly put together a collection of top notch copywriting courses and marketing courses that have a proven track record so you can create an instant (and easy) upsell funnel and exponentially increase the average transaction value-without having to develop a single product of your own!". Or... you could even bundle these together to instantly have a membership site of your own - earning you an automated, stream of income every single month! It’s all yours TODAY - if you’re one of the select few to ACT FAST. Sell the heck out of one of the most complete, bestselling training courses you’ll ever see - to your customers! You'll be one of only a few people to ever have the right to do this! Make fast money without doing any work! Everything's been done for you! Create a high end membership site! Continuity websites are one of the best ways to maximize your income with residual, monthly cash flow. You could even Feature the Ad Magic package as a premium monthly release! Create a high-end training and coaching package with this content! The included videos, reports, sample ads and other content makes it easy to do! And much, much more! You get full rights to profit from this high quality content in whatever way you'd like, over and over again! If you’ve been paying even a little attention, you already know that owning an Official Reseller License to a high quality product like the Advertising Magic Deluxe Program makes it incredibly easy to make money. You know for yourself, there is so much low quality licensable content in the marketplace that when a premium course like this comes out - it’s an opportunity for you to instantly stand out too. Your customers will be so excited by the potential profit power writing instantly-persuasive copy can give them - that they’ll want to jump in right away. There's just no way you won't make your low, one-time investment back quickly. And by being one of ONLY A FEW who ever have a reseller license, I'm safe-guarding your purchase because once these licenses have been sold out, reseller licenses may NEVER BE AVAILABLE AGAIN! So, if you are on the fence about this, you’re going to miss out. Don't wait too long because chances are, while you're reading this message, someone else is in the process of claiming one of the few remaining licenses. Once that happens... this offer ends immediately. No exceptions. I don't want you to miss out on this unique opportunity. But I can’t hold your spot for you either. If you miss this rare offer now... you’ll be kicking yourself forever. And your best chances are to CLICK HERE NOW - without wasting another minute. Nothing on the market even comes close to what we're offering here. 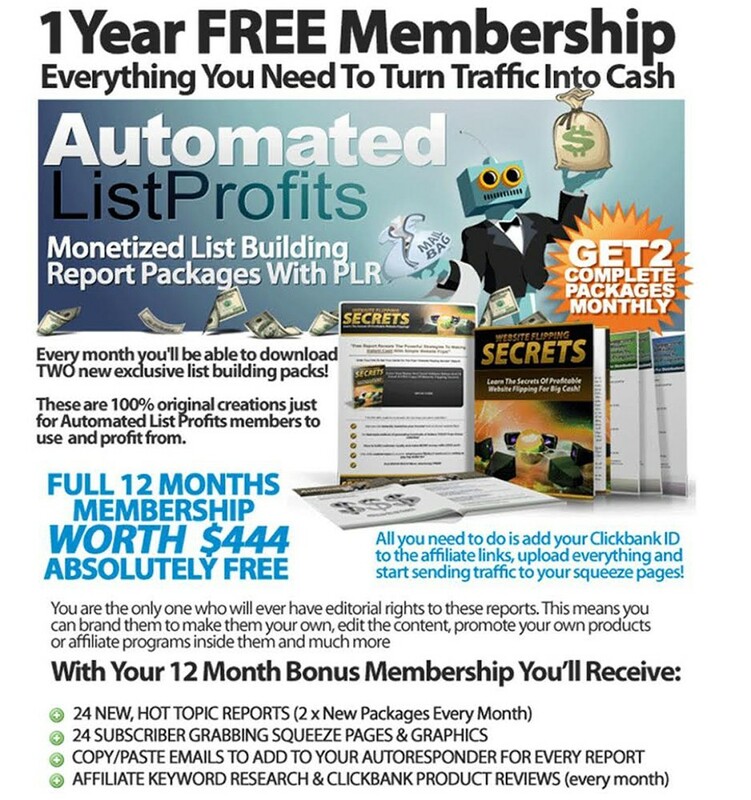 This all-inclusive Ad Magic Reseller License PLUS different profit funnel possibilities could easily net you thousands of dollars in extra monthly sales revenue! * 5 Stunning, EXTRA HIGH-VALUE BONUSES designed to make it even easier and more profitable for you FROM DAY ONE - even if you’re a total newbie when with information publishing and marketing. “If You're Ready To Easily Generate MASSIVE Profits By Selling A Premium Product Package While Having Dozens of Upsell Options Too... This Special Deal Is For You!" As you know, a reseller rights license puts you in the best position possible, because you become the publisher. When it’s already a proven winner - well, you’re pretty much guaranteed to win too! At this very moment - you have a special opportunity to join a very small, elite group of resellers who will make both fast and long-term money with this incredible product. And it can be all yours for a LOT less than you think. I know that's not a lot to ask for such a high quality package. But I wanted you - my subscriber and dear customer - to have the chance to earn from the same premium quality content that helped me get started. In order to make the decision an easy one for you, I know I’d have to make it available at a reasonable price. But remember, there are only a limited number of reseller licenses available. And the earnings potential for you as a licensee is off the charts! So it'll be really easy for you to recoup your one-time investment - simply by deploying some of the exceptional tools included with your reseller license. Now, fair warning - this offer won't last long. Once all licenses have been spoken for, I will pull this offer immediately. So, don't miss out! This is the kind of high quality content package you're customers have been waiting for! P.S: This Resellers License Package comes with everything you need to start making money today! I've done all the work for you so that you can start making money immediately. You don't want to miss this one! Limited licenses available. Once they're gone, they're gone forever. Since it’s already a proven winner in the marketplace - and AD MAGIC is spoken of by many of the world’s best copywriters as the single course that made the biggest difference in their professional lives - YOU SIMPLY CAN’T LOSE. That is... unless you lose out on this rare offer. Take action today and... reap the rewards for years to come. No Thanks! I'll miss out on this exclusive offer. Q: What are the advantages of owning the resell rights to the Adverting Magic package? A: The biggest advantage of owning the resell rights to this high-demand product (as opposed to merely promoting it as an affiliate) is that you get to set the price and keep 100% of the profits for yourself. In fact, with an Official Resellers License - YOU are in control - and that’s HUGE.In typical affiliate marketing, all those important decisions are left to the vendor. Affiliates have absolutely no control over the product, the price, or how they choose to promote it. But that’s not the only problem. Customers purchase anonymously. That’s a serious drawback because in affiliate marketing - you never get an opportunity to build your own list of actual buyers. Think about it: if you were merely an affiliate for this course, you’d be competing with thousands of other affiliates, since it costs nothing to join affiliate programs. You’d likely only get to pocket about 50% of the profit. And worse yet, your customer would come and go, without you ever knowing who they are, or having an opportunity to build a lasting relationship. Licensing (at least, in this case) changes everything - in your favor. You become the publisher and vendor. Instead of being one of a thousand different affiliates, you could have hundreds - or even thousands of affiliates working independently every day - and actually putting cash in your pocket! And since you’re the one building the customer list (the most valuable asset in information publishing) you’ll have what it takes to earn a fortune on the backend. If you’re serious about building an info business of your own - licensing offers so much more. Why not take advantage of this exclusive offer? It’s one of the easiest ways to get your info business up and running in no time - and it gives you the power of control. That’s something you just don’t get as an affiliate marketer. Q: I’m new to this – will it take a long time to get up and running? A: Absolutely not! With our templates and a little effort - you could be up and running straight away - if you want to. But there’s really no need to rush because. And your license never expires. So you can work at your own comfortable pace and set your business up in a way that suits you and the lifestyle you want. Product creation is one of the most time-consuming parts of running your own business. But you get to completely skip that step because you’ll be ready to go with a quality, in-depth product endorsed by more top-dog marketers and copywriters than any other course of its kind. Feel free to use the proven sales letter we provide or modify it to suit your specific needs. All you have to do is change the payment link to your link, and you’re ready to go. You could set it up in minutes. And if you start driving traffic to your site immediately – you could begin generating sales on day one! Using our plug-n-play solution is one option. It can certainly get you into the game quickly and easily. But if you’re looking to turn info-marketing into a life-long cash cow - I strongly recommend you go through your FREE bonus program - The A-Z Information Publishing & Advanced Direct Marketing Business System by the “Godfather of Info-Marketing” - Dan Kennedy. It’s a complete A-Z information publishing and advanced direct marketing business system by the original “millionaire maker”. It won’t cost you dime - it’s included as part of your license package. But with the steps you learn in Info Riches, you’ll be building your business on a foundation that’s a solid as a rock. How far you go and how high you soar with this unequalled business opportunity is up to you. Once you see the potential in the Info Riches system with your own eyes, you’ll know *exactly* what to do with your reseller license to turn it into a perpetual profit center - on its own, or with other products. And the sooner you take action, the sooner you’ll recoup your investment and get into the pure profit zone. And that’s what it’s all about. Intermediate and advanced marketers already know how valuable these rights are. And by the time beginning marketers finish with the Info Riches program, they too will have discovered that they’re sitting on a gold mine as an official license holder of Advertising Magic. Q: How can I make money with the Advertising Magic reseller rights? A: The sky’s the limit. In fact, the possibilities are endless. Unlike affiliate programs, you are not restricted to using only a few “approved” promotional strategies. As long as what you do is legal and ethical - you are free to market as you choose. 1. Think “inside” the box. Sell the heck out of this complete sales training course - to your customers, neighboring businesses, suppliers you already use, and businesses you already visit! Tap your network - starting today. You can get some fast sales this way and… you’ll be doing these business owners a huge favor. Fact: 93% of all businesses know very little about advertising - and even less about how to turn their words into gold - on autopilot. You'll be one of only a few people to ever have the right to offer this program. And I can pretty much guarantee that the people in your network have never seen or heard of Ad Magic before. 2. Let Others Sell It For You. Recruit your own affiliates and offer an attractive percentage of the sale price as their commission. Loads of eager sellers are out there in search of quality products that pay handsomely and sell easily and - this is it! Ad Magic is the answer to their dreams. Sure, you’ll have to split the gross profit with your affiliates - but so what? These sales are 100% - hands free. They didn’t cost you a penny and in most cases - these customers are people you wouldn’t be able to reach any other way. It’s a win-win. So begin to attract all the quality affiliates you can find and watch closely as your profits pile up. 3. Sell the Ad Magic package as a higher-ticket backend product. Deploy any related, low-cost introductory product to attract genuine buyers. (your Killer Copywriting bonus package comes with several attractive options) Buyers are what you want - they’re a different breed altogether. And the best time to offer a quality product to a buyer is immediately after they’ve made their initial purchase. Feature “Ad Magic” as your backend product and you’ll be treating your customers the right way. By doing so, you’ll be providing tons more in USE VALUE than you’re asking them to pay in CASH VALUE. And that’s a surefire recipe to riches! 4. Create additional spinoff revenue streams - like an online or offline coaching program, or even a copywriting service business where you use these secrets to write killer copy for your clients. Have you noticed how popular “coaching” has become? It’s a billion-dollar industry in the USA alone (*Source: marketresearch.com). You could easily build a coaching program around the Ad Magic course - or give it a slight twist by focusing on a specific industry. And don’t over look the fact that some people (even those who buy the expensive training courses) prefer to hire someone else to create their sales copy for them. You could be that person. 5. Create a high end membership site. Continuity websites are one of the best ways to maximize your income with residual, monthly cash flow. You could even feature the Ad Magic package as a premium release! Start any way you want. The important thing is to just get started. You get full rights to profit from this high quality content in whatever way you'd like, over and over again! I’m sure you know that you just don’t see courses of this quality and life-changing magnitude every day. The fact that you can claim it as your own, legally become the publisher and resell this top notch, evergreen, actionable, and battle-tested information on how to use words to effortlessly sell more of virtually ANYTHING... is unheard of! Q: Why should I buy the reseller license right NOW? There are two good reasons you should buy your Official Ad Magic Resellers License NOW:Reason Number One: Quantities are strictly limited. I expect smart and savvy thinkers who can see the massive potential offered here to snap this up in a hurry. But I want to make this fair for every buyer. And that means limiting the window of opportunity. So this special offer won’t last long. Once the few available licenses are claimed - this offer expires immediately. No exceptions. Reason Number Two: Your 50%-off special offer is going away. Be forewarned - this one-time-only MASSIVE DISCOUNT is coming to an end. Once it’s over - it’s over. The price of the Official Ad Magic Resellers License then reverts back to $1997. At that price - it’s still an outstanding deal for a lifetime of potential profits in info publishing. But seriously, why pay more than you have to? It just makes good business sense to save. And a 50% savings is HUGE! You can climb your way to the top of the mountain… or you can take a helicopter. The choice is yours. One approach can take years. The other gets you to the place you want to go much faster and easier. Remember, Advertising Magic is a detailed course written by a seasoned marketer and copywriter with years of experience - Brian Keith Voiles. He’s recognized as one of the best copywriters in the world - with an “A” list of clients and powerful testimonials to prove it. Ad Magic is a proven winner. And here, you get all the tools to capitalize on this track record of success - on your own terms and for the rest of your life. Claim your own official license - and get started on the adventure of a lifetime today!